So You are Choosing An Orchid, a pretty little Orchid for your home. Which one do you choose? There are so many different ones and they are so beautiful. It is great that you want to trying growing orchids. I want you to know that many orchids are easy to grow. Please don't be afraid! There are just a few things that you need to consider and to be careful of when choosing an orchid. Even if you are a beginner with orchids you can learn to grow orchids successfully! You want look at where your orchid will be spending its time. What kind of light can you supply for the orchid? What are the temperature ranges in your growing situation? Are the orchids that you want to grow or that you have able to survive and thrive in those temperatures? What is the humidity that you can provide in your growing situation? What kind of water do you have available? Will your orchids need purified water? Many do not require pure water but some do. Will you be able to grow some of your orchids outside or are you going to grow indoors? If growing indoors will you be growing under lights or using the natural light? As you can see there are a few things to consider when choosing an orchid. 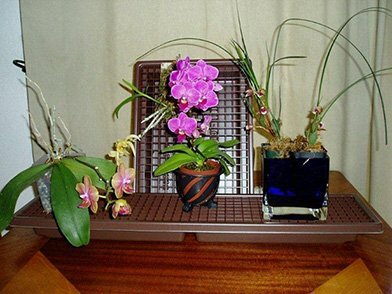 You need to pick your orchid according to the environment that you can provide for your plants. When you match the micro climate that your orchid came from (its home in the wild) to the environment of your home or growing situation your orchid will thrive. And if it thrives it will reward you by re-blooming. How great is that! Check out these tips and get the Best Orchid for your home. Frequently Asked Questions About Orchids. The last link will take you to a list of different kinds of orchids and tips for caring for orchids. This is a great resource for growing orchids for beginners. Good luck! And let me know how it is going. I am available for questions and help and personal orchid consultation. Contact me if you have orchid growing questions ??? I am happy to help you Choose An Orchid.